Pictures of ships in drydock. Ever since I was very young, I have always been very fascinated by ships in dry dock. First of all because we get to see something we normally not see and second of all, we get to study details of technical systems. Within the main web page of CaptainsVoyage, you will soon be able to see my own images from the dry docks I have participated in - on the SS Norway and the Crystal Symphony (the pages were lost during HDD-crash but are almost restored now). If you have any pictures of this nature, please take a moment to share them here. Any type of ship will naturally be greatly appreciated. As some of you fellow CV-officers already know, I love studying details in photographs and pictures of ships in dry dock is absolutely no exemption. Looking forward and hoping dearly for a lot of participation in this thread. Ah, Jan-Olav!! Here's a beauty for you here. That is an awesome image which really shows her size and power. I am glad to see this thread come back to life. It is one of my favorites. It is intresting to look at the prop and rudder layout of Queen Elizabeth. You can tell she was meant for long fast voyages. One rudder with no propwash must have made maneuvering in port difficult. I suppose they used tugboats for almost all maneuvering when going slow. 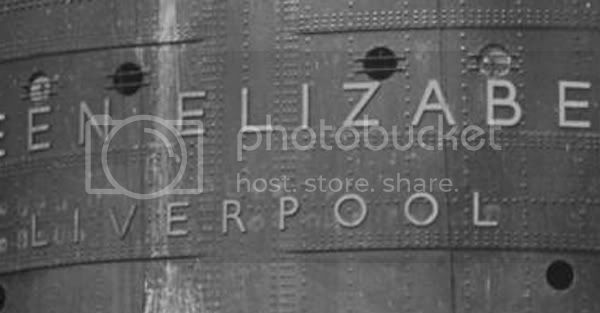 Aha, I've found another of Queen Elizabeth in drydock. And of course, one more. A little overtime but still very interesting: in the last image, could someone tell me what is behind the portholes just above the name at the stern? I seem to recall that those were brigs for unruly passengers (and crew) but I'm wondering if that was onboard the one Queen Mary. Unless it's my rubbish eyesight, I think I can see two bars over the portholes. You may be right Jan-Olav! Glad I'm not there right now! "Fabio"--there really is a purser named "Fabio"????? Is this a ship or a flaoting Pizza Parlour? What is that contraption on her stern? Looks like an A-frame on a Trawler, bu I guess the don't catch their own fish. ombugge--you are both brilliant and FUNNY!!!!!!!!!!!!!!!!!!! BERGE STAHL is the biggest orebulkship in the world. 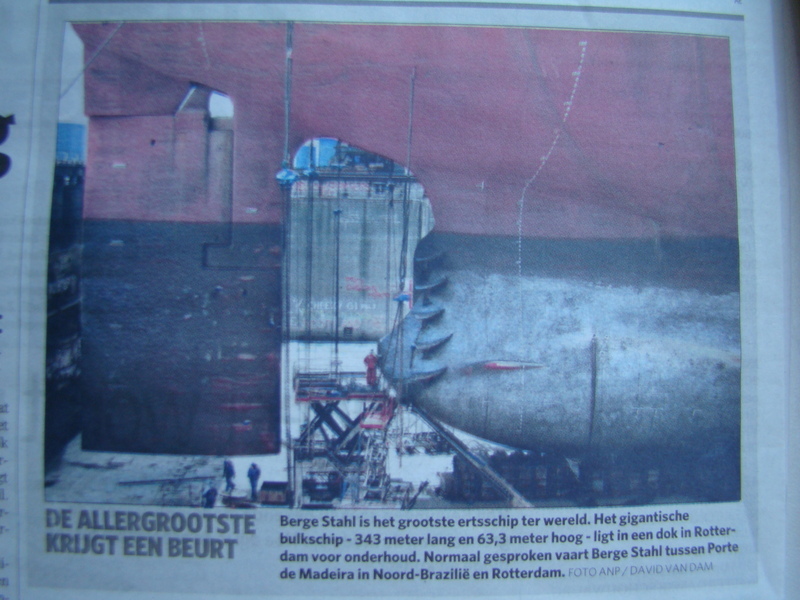 the gigantic bulkship -343 meter long and 63,3 meter high- lie in a dock in Rotterdam for maintenance . normaly spoken sail the BERGE STAHL between Porte de Madeira in Northern-Brasil and Rotterdam. within that proportian of that rudder. Somebody run off with the Propeller!!! That is worth a few millions alone.